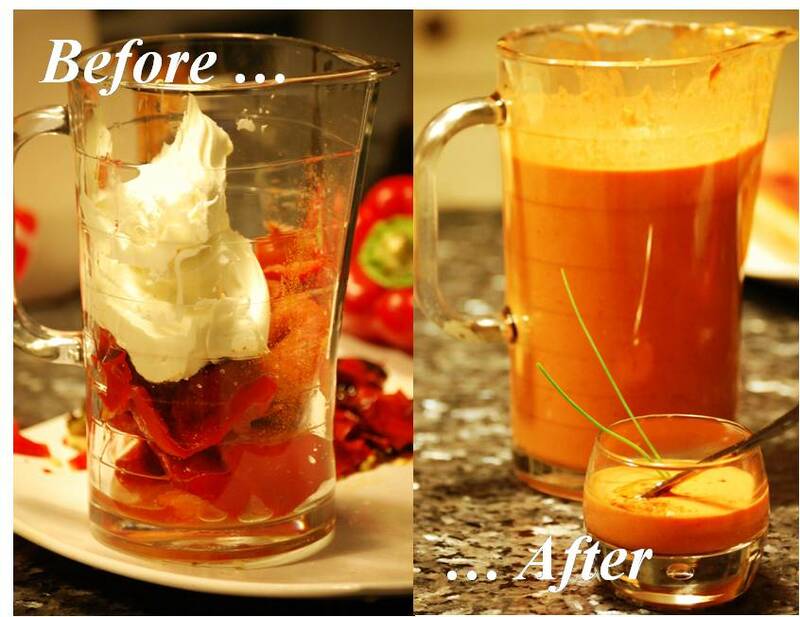 The Cooking Blog of Emilie French Chef: Wanna try a Sweet Red Pepper Cream Shot ??? In France, Verrines and small Plates are a big hit. Imagine serving you favorite appetizers in small glasses or in small spoons. You are a picky or a small eater ?? you can just sample a couple of them. You are a big hungry man ?? you can eat as many verrines as you want, without any guilt, the portions are small and irresistible !!!! I love small portions & I absolutely love roasted Peppers so I wanted to share with you this Sweet Red Pepper Cream ... oh man, it was so miamm, so yummmy, so hmmmm !!! The only "technical" part of this recipe is that you need to broil the Peppers in order to peel them easily (see the recipe below for directions). Then you mix the Pepper meat with Mascarpone & Spices, add a hint of red Pimento (the secret Ingredient to spice up a little bit this creamy Soup), et voila, you're done in 3 minutes !!! A bientot & bon Appetit ! Black the Peppers in the broiler turning the peppers over halfway through (around 5mn each side or until they are black). Remove them from the oven and put them in a plastic bag. Close the bag. They will steam in the bag and will start loosing their skins. After 10mn, open the bag, and peel the pepper with a knife (it is very easy). Slice them and remove the seeds. Put the Mascarpone, the Peppers meat, some Salt & Pepper and a hint of red Cayenne Pimento into a blender. Mix everything. Taste and add more Salt or Pepper if necessary. Serve warm for starter or cold in small glasses / cups for small appetizers. Add 1 or 2 drops of Olive Oil on the top and sprinkle a few of red Cayenne Pimento (add a string of Chive for decoration if you want).